Have you ever wondered about the inspirations behind Charles Dickens’ timeless tale, A Christmas Carol? You may also be asking yourself, “Do we really need another Christmas Carol movie?” Well yes, and no, depending upon how you look at it. The Man Who Invented Christmas does center on the book, A Christmas Carol, however the bonus is you’ll be able to go backstage and become immersed in Dickens’ (Dan Stevens) creative fanciful process whilst he was writing of the treasured story way back in 1843. Yep, there’s the grumpy, old penny-pincher killjoy, Ebenezer Scrooge (Christopher Plummer) and by contrast the charming sickly little guy, Tiny Tim, (Pearse Kearney) with his crutch. You’ll see where the expression ‘Bah Humbug!’ originated, the name Marley, as in Jacob Marley and other names/inspirations. Perhaps the most fascinating aspect is being a witness to the writing process while under pressure. 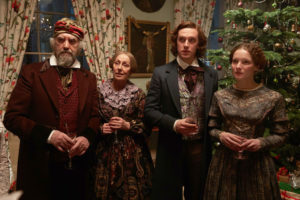 Based in part from historian Les Standiford’s 2008 book, The Man Who Invented Christmas: How Charles Dickens’s A Christmas Carol Rescued His Career and Revived Our Holiday Spirits, we learn that Dickens had three flops prior to writing the holiday story and was buried in debt. He was also under deadline to finish the book before Christmas, with a Dec. 19 debut, the book miraculously sold out by Dec. 25, 1943. Reflecting upon the poverty in London leading up to 1943, especially the treatment of poor homeless street children, the film’s other themes includes celebrating with food, festivities, dance and drinks, opening ones heart to embrace those less fortunate and the spirit of giving. 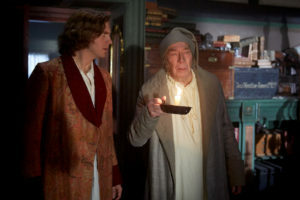 Simon Callow a Charles Dickens historian and expert was sought out by director Bharat Nalluri (Miss Pettigrew Lives for a Day) and screenplay writer Susan Coyne early in the script’s development. I was fortunate to see a live stellar performance of The Mystery of Charles Dickens in Chicago at the Shakespeare Theater in 2001in which Callow stared as Dickens. What excites Callow about the film is that people’s notion of Dickens as a bearded older, stuffy Victorian writer, will be changed as in fact he was a father of four, handsome, witty and lively guy who completed the novel at age 31. His greatest joy in life was acting out his own written works. Dickens often worked out scenes from his novels by playing the characters himself. The Man who Invented Christmas gives a nod toward those mini dramas and we are the benefactors. The filmmakers later offered Callow the part of illustrator John Leech, who created memorable images of Scrooge and the ghosts that haunt him. 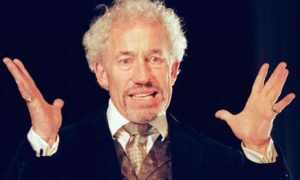 Simon Callow an expert on Charles Dickens plays John Leech. 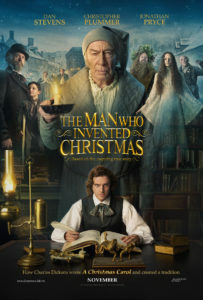 As a Dickens fan myself, I appreciated the films attempt to bring the author to the forefront by presenting him as a real person with conflicts and emotions. Some of you may be surprised to know that Dickens suffered terribly as an 11 year old child, when his father was sent to debtor’s prison, causing him to be sent to Warren’s Blackening factory to work off his father’s debt. He walked three miles, six days a week, working 12 hours a day gluing labels to bottles of shoe polish under horrendous conditions. Not surprisingly, you will see Warren polish labels in the film if you look closely, and young Dickens working in the factory. Cast: Dan Stevens (“Legion,” Beauty and the Beast), Christopher Plummer (Beginners, A Beautiful Mind), Jonathan Pryce (The Man Who Killed Don Quixote, Pirates of the Caribbean: Curse of the Black Pearl), Justin Edwards (Love & Friendship, The Thick of It), Morfydd Clark (Love & Friendship, The Falling), Donald Sumpter (“Game of Thrones,” The Girl With the Dragon Tattoo), Miles Jupp (Journey’s End, The Monuments Men) and Simon Callow (The Rebel, Victoria and Abdul) with Miriam Margolyes (The Age of Innocence, Romeo +Juliet), Ian McNeice (Ace Ventura: When Nature Calls, White Noise) and Bill Paterson (“Fleabag,” “Churchill’s Secret”).